Thank you for taking a pause with me each week to find the grace and gratitude for what quilting adds to our lives. This is wonderful and yes on that last one. Definitely! Thanks for the sentiment and the link. I’m definitely doing OK and enjoying my life right now. Thanks for the thought-provoking post. I enjoyed reading the lists of signs, and it’s nice to have a reminded that things are going well! I totally agree with the points you made here, and the one “a place of your own” made me realize MY place is my corner of my sewing room–which is why I get really grumpy when other people clutter it up, especially the cutting table. Thank you for sharing that link, Yvonne. A lot of days I have trouble keeping things in perspective and seeing how well I’m actually doing. This was an excellent reminder! But on the plus side, I am interested in many things!! and I love to quilt and sew, and even with my crazy busy life, I find little pockets of time to quilt. <3 Life is good. ps. 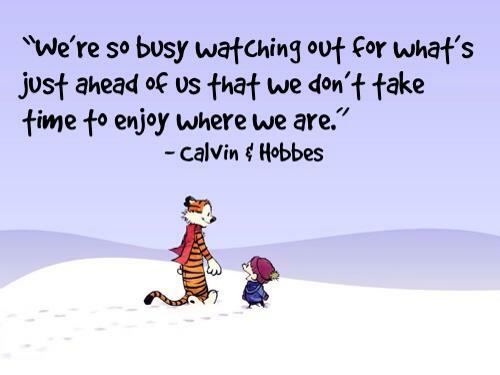 I LOVE Calvin and Hobbes. Love love LOVE. I needed this read and am saving it for future… this is amazing. We all need those reminders and I agree with you about #19, I feel like I now have justified how much fabric I buy is not an issue! haha. It’s always nice to remember or be reminded of how much we do rather than what we don’t. Very good points! Perfect for a Thankful Thursday and I’ll go read the article now, hopefully I’m doing better than I think too!